I've been trying to re-focus the blog component of this site to be more research oriented so I'm somewhat loathe to do a "status update" type post but I've been totally out of the loop for a few weeks and wanted to share some stuff. First off, I checked out the Alexa at Arri CSC's "Meet Alexa" event in Secaucus, NJ a few weeks ago. Getting out of bed at 7:30 to get to Jersey by 9AM on a Saturday morning was painful but totally worth it. It's such a simple system so there's really not much to say. It's a little smaller than a RED One, beautiful design and ergonomics, brilliant color viewfinder, etc. Despite what some camps are pointing out, the images we shot and examined at Arri seemed incredibly sharp and resolved. Almost too sharp. The latitude and sensitivity are simply amazing and the skin tones are beautiful right out of the gate. That's the thing - this is a "digital film" camera in the sense that it's intended to produce a high quality, robust, and faithful image that will be taken into a Digital Intermediate suite for grading and finishing - just like celluloid. There is no painting this camera on-set other than doing some non-destructive LUT's in SpeedGrade or a similar application. In fact, just like selecting a traditional motion picture film stock where you can only choose a color balance (3200k, 5500k) and ISO/EI, Arri has tried to keep it familiar with the Alexa where you have only 4 ways of affecting the image in-camera - Sensitivity (ISO), White Balance (Kelvin), some basic Tint Control (Green/Magenta), and you can also switch between a Linear and Log Gamma curve depending on your workflow. Working within these parameters, shooting ArriRaw to a data recorder like a S.Two OB-1 will buy you the most visual information and is the most quality conscientious way to work with the camera. Because the Alexa also has the ability to record non-raw, raster video in the form of master quality ProRes 4444 files, I was hoping for some basic paintability in the event a producer wants to use them for their online. These files are very robust so I predict a lot of productions will opt for the ProRes workflow as it's faster and more cost effective. I totally understand why Arri didn't include Paint menus though. They really want you to think of this more like film than video. 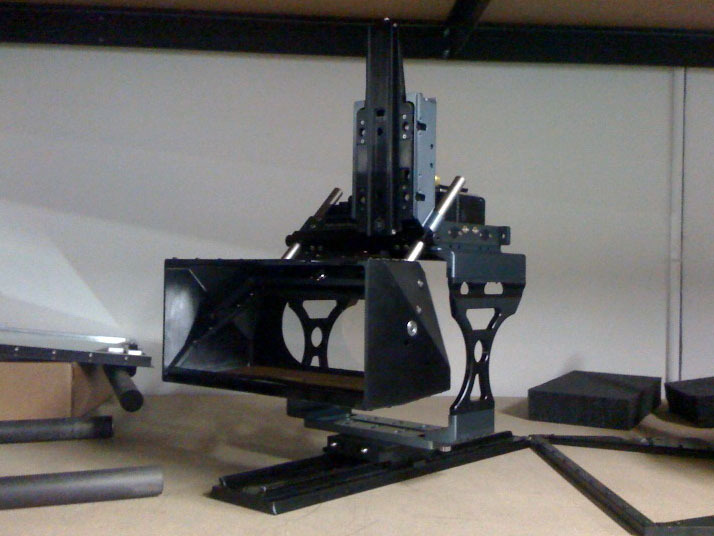 Next up, I just returned from a week at Element Technica in L.A. getting trained on their stereoscopic rigs. This stuff is so f-n cool. Prior to this I had no hands-on experience with stereoscopic video and the first time you successfully align the cameras and see the 3D effect come to life on the monitor is a pretty sweet feeling. Right now, there simply aren't enough training options for 3D. There are a handful of courses being offered and most of them are very exclusive and/or expensive or focused on a specific product such as the upcoming Panasonic AG-3DA1 so if you want to really learn this stuff you have to be aggressive about it. Here's the Quasar Rig built out in Under-Thru Beam Splitter Mode with 2x R1's. Quasar in Side by Side for when greater Inter-Ocular is required. Neutron Rig (for smaller camera heads like the SI-2K) in Over-Thru Beam Splitter Mode. Neutron Rig in Side by Side Mode. It was a great week and I really enjoyed getting to know all the people who were there doing the training. I already miss our long, beer soaked lunches at Father's Office. But as usual, what I always miss most about L.A. - Amoeba Music! We used to have the Kim's Video Superstore here in NY and that paled in comparison to mighty Amoeba but now we don't even have that. Kim's has sadly been reduced to a tiny one room store in the East Village. Makes me sick..